If there is a common thread between the different terrorist groups acting in the name of Islam such as ISIS or Al-Qaida and the like, it has to be the fact that they adopted the view that tawheed is divided into three: Tawheed Al-Ruboobiyya, Al-Uloohiyy and Al-Asmaa Wa Al-Sifaat. This division is not found in the Qur’an or in the teaching of the Prophet (pbuh) nor was it reported from the three blessed generations (the Companions, the Followers and the Successors). Neither was it reported from any of the great Imams such as Abu Hanifa, Malik, Al-Shafi’i, Ahmad bin Hanbal or their peers. It was first introduced during the eighth century hijri by Ibn Taymiyya. It was also adapted by his student Ibn Al-Qayyim but the rest of the scholars of the Ummah did not accept it and consequently the idea rightfully died out until the coming of Muhammed bin Abdul Wahhab in the twelfth century. He resuscitated the ideas of Ibn Taymiyya and started to spread and impose them on the Muslims by force. Among the innovations (bid’aat) that he spread was the trinity of tawheed. 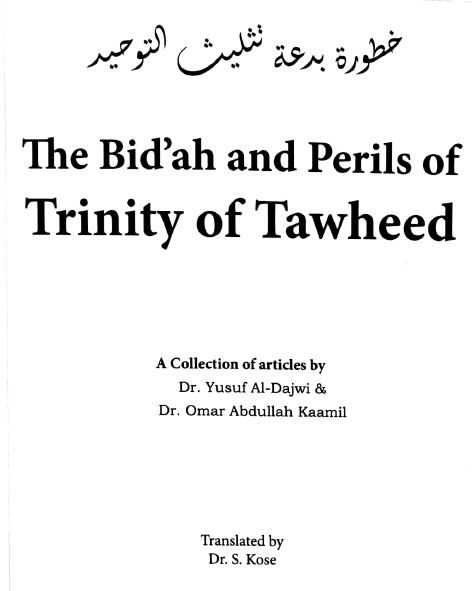 I wanted to compile in this booklet what some of the scholars of main stream Islam (Ahl al-Sunna wa al-Jamaa’h) had to say regarding the trinity of tawheed and tawassul. 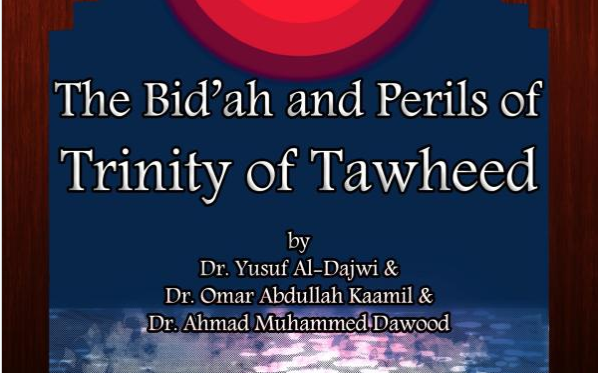 Hopefully the reader will appreciate how dangerous this bid’ah is and how it resulted in grave consequences in terms of suffering and much bloodshed in the Muslim world. Who is Right According to Qur'an and Sunnah: Ibn Baaz, Ibn Uthaymeen or Albani?